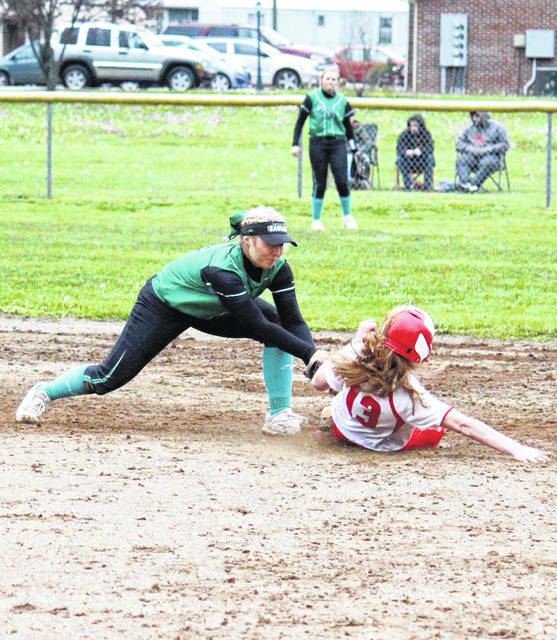 Eastern junior Emmalea Durst (right) slides into home in front of Wahama junior Maddy VanMatre during the Lady Eagles’ 6-run setback on Wednesday in Hartford, W.Va.
Eastern senior Sidney Cook tags out Wahama junior Logan Eades, during the Lady Falcons’ 14-8 victory on Wednesday in Hartford, W.Va.
HARTFORD, W.Va. — A split for a change. 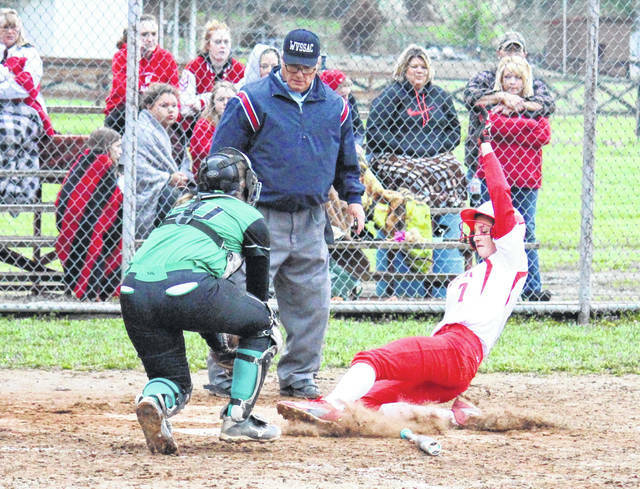 For the first time since 2012, the Eastern and Wahama softball teams split the season series, as the Lady Falcons won the first game of Wednesday’s Tri-Valley Conference Hocking Division doubleheader in Mason County by a 14-8 count, but the Lady Eagles claimed revenge in the night cap, taking an 8-7 walk-off victory in nine innings. 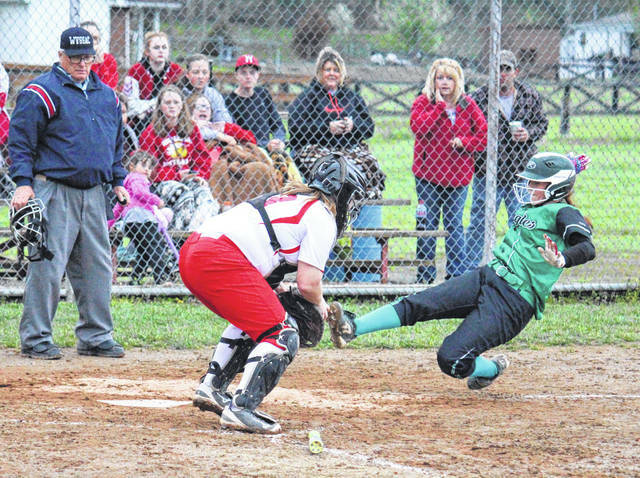 In the opening game, Eastern (13-3, 11-2 TVC Hocking) jumped out to a 3-0 lead in the first inning, as Sidney Cook hit a solo home run, and then Tessa Rockhold drove in Emmalea Durst and Kennadi Rockhold. After stranded runners at the corners in the first inning, Wahama (12-9, 8-2) took a 4-3 lead in the bottom of the second, as Hannah Rose singled home Autumn Baker, then Emma Gibbs singled home Grace Haddox, and finally Emily VanMatre doubled home Rose and Gibbs. After being held off the board in the second, the Lady Eagles were back in front in the top of the third, as Kelsey Roberts hit a two-run home run, and then Tessa Rockhold followed with a solo homer. WHS left a runner on second in the third inning, but retired Eastern in order in the top of the fourth. The Lady Falcons turned their 6-4 deficit into an 8-6 lead in the bottom of the fourth, as Rose drove home Haddox and then scored on a Maddy VanMatre single, Victoria VanMatre drove in Emily VanMatre, and finally Logan Eades scored on an error. EHS got one run back in the top of the fifth, as Durst scored on a sac-fly by Tessa Rockhold. 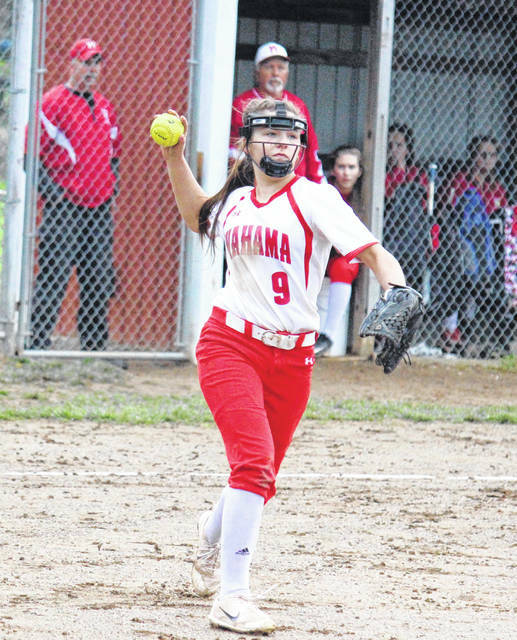 However, Wahama’s lead was up to 10-7 in the bottom of the inning, when Maddy VanMatre singled home Rose and Gibbs. Wahama added four insurance runs in the bottom of the sixth, as Rose hit a three-run triple and then scored on a passed ball. Cook led off the top of the seventh with a home run for EHS, but the Lady Eagles couldn’t add on after that and fell by an 14-8 count. Hannah Billups was the winning pitcher in a complete game for WHS, striking out one and allowing eight earned runs on 11 hits and three walks. Tessa Rockhold suffered the pitching loss in 5⅔ for Eastern, giving up 13 runs, 12 earned, on 18 hits and a walk, while striking out two. Elaina Hensley pitched the remainder of the game for EHS, allowing one hit and one unearned run. Rose led the victors at the plate, going 4-for-5 with a triple, a double, four runs scored and five runs batted in. Emily VanMatre was 3-for-4 with a double, a run and two RBIs, while Maddy VanMatre was 3-for-4 with three RBIs in the win. Gibbs and Haddox both singled twice and scored twice, with Gibbs picking up an RBI. Billups and Victoria VanMatre both recorded two singles, with Victoria VanMatre earning an RBI. Ashtyn Russell contributed a single to the winning cause, Eades chipped in with a pair of runs, while Baker, Harley Roush and Kailyn Alison each scored once. Cook led the guests at the plate, going 3-for-4 with two home runs, one double, three runs scored and two runs batted in. Roberts and Tessa Rockhold both scored once, hit a home run, and hit a double, with Tessa Rockhold earning four RBIs and Roberts recording two. Durst singled once and scored twice in the setback, Sydney Sanders, Kelsey Casto and Courtney Fitzgerald each singled once, while Kennadi Rockhold scored a run. The Lady Eagles were responsible for all-3 of the game’s errors. Wahama left six runners on base, one more than Eastern. In the second game, with the Lady Falcons batting as the visitors, Wahama took a 1-0 lead as Gibbs scored after a trio of EHS errors. After the Lady Eagles stranded a runner in scoring position in the bottom of the first, Wahama went up 2-0 in the top of the second, as Rose drove in Victoria VanMatre. Eastern trimmed its deficit to one in the bottom of the second, as Casto drove in Sanders. However, Wahama stretched its lead to 4-1 in the top of the third, as Emily VanMatre scored on an error, and then Russell scored on a Victoria VanMatre sac-fly. EHS was retired in order in the bottom of the third, but kept the Lady Falcons off the board in the top of the fourth. Eastern went up 5-4 in the bottom of the fourth, as Kennadi Rockhold hit a three-run triple and then scored on a Cera Grueser single. WHS tied the game in the top of the fifth when Victoria VanMatre drove in Eades, but the game wasn’t tied for long. In the bottom of the fifth, Fitzgerald drove in Sanders, and then Casto brought Tessa Rockhold around to score, giving EHS a 7-5 advantage. The Lady Falcons answered in the top of the sixth, as Gibbs drove in Haddox, and then Emily VanMatre drove in Rose, tying the game at seven. Eastern had two runners in scoring position with one out in the bottom of the sixth, but couldn’t break the 7-all tie, as a double play ended the inning. Neither team reached base in the seventh inning, and Wahama had the first chance in extras. After stranding a runner on third base in the top of the eighth, WHS stranded one on second in the following inning. EHS went away in order in the bottom of the eighth, but Cook led off the bottom of the ninth with a walk-off home run giving Eastern the 8-7 victory. Tessa Rockhold was the winning pitcher of record in 3⅓ innings of relief for EHS, allowing three hits and one walk. Hensley started for the victors, pitched 5⅔ innings, struck out one batted, and gave up seven runs, three earned, on seven hits and a walk. Rose took the loss in a complete game for Wahama, striking out two, while surrendering eight runs, three earned, on 10 hits and a walk. Cook led EHS at the plate again, this time going 3-for-4 with a home run, a double, a run scored and a run batted in. Roberts and Tessa Rockhold both doubled once and singled once, with Tessa Rockhold scoring twice. Grueser singled twice and drove in one run for the Lady Eagles, Kennadi Rockhold recorded a triple, a run, and three RBIs, while Casto earned one run and two RBIs. Sanders scored twice in the win, while Ally Barber scored once. Emily VanMatre led the Lady Falcons, going 3-for-5 with a run and an RBI. Maddy VanMatre singled twice in the setback, Rose doubled once, scored once and drove in a run, while Victoria VanMatre singled once, scored once and drove in two runs. Russell and Haddox both singled once and scored once for WHS, Baker added a single, while Eades and Gibbs both scored once, with Gibbs also earning an RBI. Eastern committed eight errors and left seven runners stranded, while Wahama had two errors and 10 runners left on base. After visiting Waterford on Thursday, Wahama will head to Federal Hocking on Friday. The Lady Eagles are scheduled to vist Miller on Thursday, and then return home to face Wellston on Tuesday.